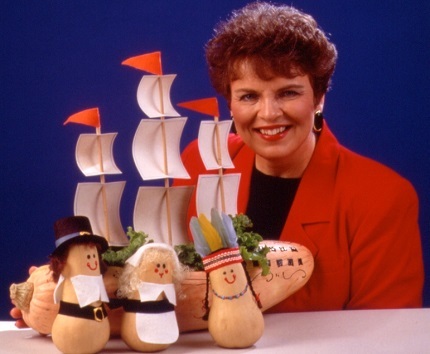 For me, one of the most memorable Thanksgivings came when my niece and nephews got my Holiday Fun Year-Round book out and came to me and asked if they could make the Pilgrim and Indian Centerpieces. I have found that when I have a project to do with kids, it is an invitation for me to get to know them better and create an experience for me to bond with them. As I left the house after going with them to trick or treat, my niece looked up to me and said, “When can you come back and play with us again?” Kids love to do things with adults. 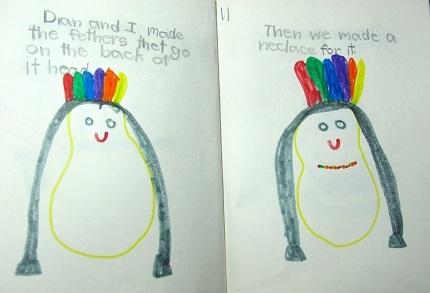 After making the project I am going to share with you, my niece wrote about it in a book titled, Fun with Dian. It was not dated but, I would guess that it was written when she would have been in the second grade. Both it and the memories are priceless. Cut a slice off the bottom of the squash to allow it to stand upright. Paint eyes and mouth on the narrow end of the squash. Add small dots of paint around the Indian’s neck for beads. Paint designs or use braided trim around the wide portion of the squash. Allow to dry. For the Indians, glue two braids of craft hair to a narrow decorative headband ribbon or braid. Tuck some small feathers under the headband. Glue or pin the headband and hair in place. Adapt the Pilgrim patterns to fit the size of your squash. Cut pattern pieces from the white felt. Make pleats in the corners of the cap to shape it, and fold back ¼” from the brim. Glue on the craft hair, cap, apron, and collars. Glue on a belt made from a narrow piece of ribbon. Using puff paint, add a gold belt buckle. Pin on the man’s hat. Tie a small bow and glue it on the woman’s neck. For more creative ideas like this go to Dian’s website at www.dianthomas.com. She has many holiday specials on all of her creative books. Give books that will keep giving to you and to your kids and grandkids. It is the way to make memories that last forever, and Dian has done all the hard work of coming up with the ideas and creating the books that keep giving and giving.